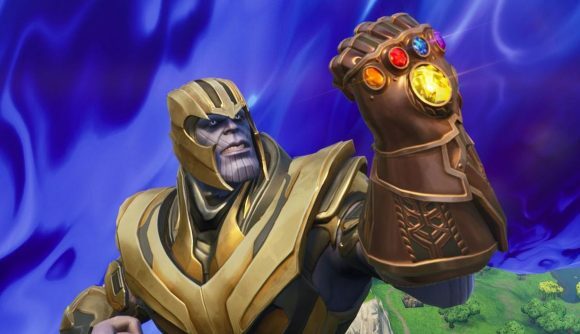 Predictably enough, it looks like last year’s Thanos-hunting limited time mode (LTM) may be returning to Fortnite ahead of the release of Avengers: Endgame. The clues come to us via Skin-Tracker.com‘s Twitter account (and Fortnite Intel), which spotted some curious kill feed messages in the latest v8.30 patch. Among these are mentions of ice fiends and ice brutes, of unleashing infernos and zapping people of the sky, and most tellingly, a death message saying a player “yielded to the POWER of Thanos”. You can see the strings in the tweet below. This isn’t the first time a datamine has pointed to the possible return of the Thanos mode. Back in October, the 6.20 update tuned Thanos’s laser ability, which stirred a flurry of speculation that the mode would return at some point, perhaps alongside one of the first trailers for Endgame. It didn’t happen, but it was a clear sign that developer Epic hadn’t abandoned the mode. And with the movie now just over two weeks away, the timing is ideal. In other recent Fortnite news, here’s where to find the new reboot vans to revive your squadmates Apex Legends style, and how to unlock the Fortnite Ruin skin. Fortnite saw much of its astonishing growth throughout 2018, and the Thanos crossover event stands out as a definite spike in that ascent. If you missed it, the rules are pretty simple. Thanos’s Infinity Gauntlet drops from the sky onto the map, and any player who picks it up becomes Thanos, with all the gauntlet’s powers. This means a range of powerful abilities (including that laser), but you lose the ability to build, or to use the game’s regular weapons.